Abdulla Al Ghurair is the Emirati billionaire and the scions of a prominent UAE business family. In 1967 Abdulla founded Mashreq bank which is now becomes the one of the country’s leading bank. He serves as the chairman and his son Abdul Aziz is CEO of the bank. The family holding company is managed by the outsider with the help of Abdulla’s sons who look after the various divisions including the real estate, food and construction business. Abdul Aziz is also the head of the family business of the Gulf Network Cooperation Council, which aim is to modernize and diversified the family businesses, and ensuring that business remain in family hands. Abdullah Al Ghurair estimated net worth is US $ 6.4 billion and he is ranked first in the list of top 10 richest people of United Arab Emirates. Majid Al Futtaim is the Emirati billionaire and the owner of the Al Futtaim holding that owned and operated in the retail, leisure, shopping malls in the North Africa and in the Middle East. Al Futtaim holdings are diversified in the three subsidiaries of retail, properties and Al Futtaim ventures. His venture group provides the amenities such as the financial services, cinemas, entertainment, leisure, fashion and healthcare products and also deals in food and beverages. Majid Al Futtaim estimated net worth is US $ 6.2 billion and he is ranked second in the list of top 10 richest people of UAE. Micky Jagtiani is the Indian entrepreneur and based in UAE and the owner of the Landmark Dubai based retail store group. His family business is diversified into hotels, foods, leisure and in electronics and his company is also operated in logistics and distribution and has more than 45,000 employees and 1000 stores in all across Middle East, Gulf and India. He also holds the stakes in the high street retailer firm of UK Debenhams and he plans to expend his business from the Gulf countries to China. Micky Jagtiani estimated net worth is US $ 5.2 billion and he is ranked third in the list of top 10 richest people of UAE. Saif Al Ghurair is the Emirati billionaire and the CEO of the Dubai based Al-Ghurair group which is the largest manufacturing and real estate firm of UAE. He is the former chairman of family holding company Al Ghurair Group with his brother Abdulla who is also a billionaire and both are scions of an old Dubai merchant family. Saif’s sons are also holds positions within the group that has interests in banking, plastics for food packaging and in steel. He is also a major shareholder in Mashreq bank which is the leading bank of UAE. Saif Al Ghurair estimated net worth is US $ 3.4 billion and he is ranked at No. 4 in the list of top 10 richest people of UAE. Abdulla Al Futtaim is the Emirati billionaire and the owner of the conglomerate Al Futtaim holdings with his brother Majid Al Futtaim who is also a billionaire. His company is the exclusive distributor of Honda and Toyota vehicles in the United Arab Emirates and has retail stores of Toyotas in Egypt. The adding up his automotive business, Al Futtaim also owns the franchises of Ikea, Toys and Marks & Spencer which fasten its real estate projects like the urban community of Dubai Festival City, and the newly opened Cairo Festival City. Abdullah Al Futtaim estimated net worth is US $ 3.2 billion and he is ranked at No. 5 in the list of top 10 richest people of UAE. Yousuf Ali is the Indian born Emirati businessman and the managing director of the EMKE LuLu Group of companies; that headquarter based in Abu Dhabi. His business group also owns the LuLu Hypermarket in the Gulf countries. He also acquires the iconic Scotland Yard apartments in the London and plans to build a luxury hotel. He also expands his retailing empire to 119 hypermarkets, grocery outlets, supermarkets and dozens of stores and malls in the South Asia, Africa and in India. Yousuf Ali estimated net worth is US $ 2.5 billion and he is ranked at No. 6 in the list of top 10 richest people of UAE. Ravi Pillai is also the Indian born Emirati entrepreneur and business magnate. He is the head of the RP Group of companies that drives his fortune from the constructions firm Al-Hajri corp. that he established with his Bahrain partner. He also plans to expend his business into real estate and building the 110-story building in Dubai and has made investments in malls, hotels, school and in banks. Ravi Pillai estimated net worth is US $ 2.4 billion and he is ranked at No. 7 in the list of top 10 richest people of UAE. Sunny Varkey is the Emirati Dubai based educational entrepreneur and humanitarian. He is the creator and the chairman of the GEMS Education system which is the largest operator of the private school from Kindergarten to grade-12 and has the network of 130 schools in Middle East countries. He is also the chairman of the Varkey Group and the trustee of the philanthropic foundation. He is also the Goodwill ambassador of UNESCO. Sunny Varkey estimated net worth is US $ 2 billion and he is ranked at No. 8 in the list of top 10 richest people of UAE. BR Shetty is the managing director and CEO of the Abu Dhabi based UAE Exchange and the new medical group of companies. The business group was established in 1975 and initially just deals in hospitality but later the company’s diversified its business in the sectors including the global financial services, retail, pharmaceutical, information technology and in advertising. His other firms UAE Exchange also becomes functional in India and provides banking services and also acquire the Travelex Holdings in last year. BR Shetty estimated net worth is US $ 1.7 billion and he is ranked at No. 9 in the list of top 10 richest people of UAE. Azad Moopen is the Dubai-based Indian physician, philanthropist and the founder of the Medicity Healthcare facility if Asian pacific. He is the chairman and the MD of the Aster Healthcare conglomerate which was established in 1987. He also provided the healthcare facilities in Indian and has MIMS hospitals with 3,000 employees. Azad Moopen estimated net worth is US $ 1.1 billion and he is ranked at No. 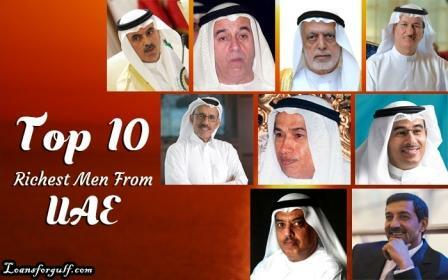 10 in the list of top 10 richest people of UAE.